Albert Wendt is an acclaimed novelist, poet and short-story writer who was born in Western Samoa in 1939. At age 13, he was sent from Western Samoa to the New Plymouth Boys’ High School in New Zealand on a government scholarship. Wendt stayed in New Zealand to eventually earn an MA in history from Victoria University in Wellington. His writing has been inspired by his experiences of growing up both in Samoa and New Zealand and his continued affection for both of these lands and the rich and complex cultures they contain. In 1965 Wendt returned to Samoa to teach at, and eventually run, Samoa College. 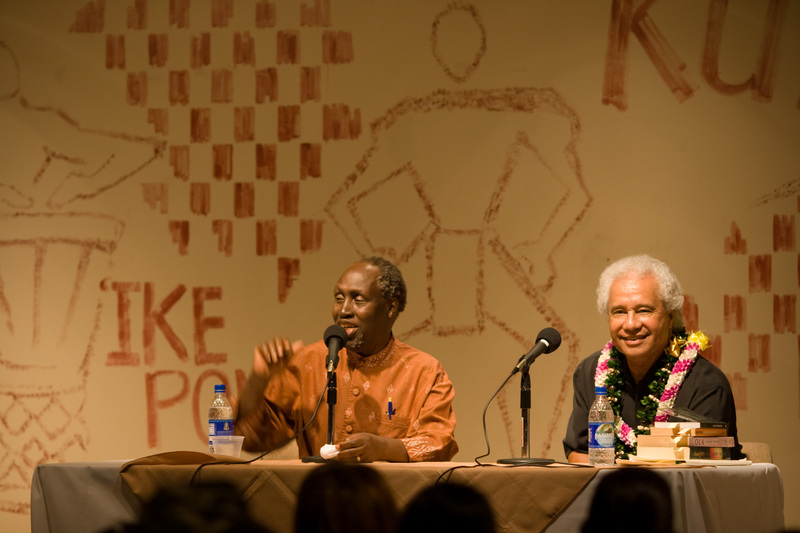 In 1974, he took up an appointment as Senior Lecturer in English at the University of the South Pacific in Fiji. Always interested in the administrative side of academia, he eventually became chair of the English Department, Dean of the School of Education, and eventually the Deputy Vice-Chancellor of the University. In 1998 he moved to the University of Auckland where he was appointed Professor of New Zealand Literature. Regarded by many as the Pacific’s most talented writer, Wendt has written novels, short story collections, and poetry collections. His third novel, Leaves of the Banyan Tree, won the New Zealand Wattie Book of the Year Award. He has also edited two major anthologies of contemporary Pacific literature, Lali (1980)and Nuanua (1995), as well as a series of five volumes on contemporary poetry from Fiji, Samoa, Vanuatu, the Solomon Islands, and the New Hebrides for Mana Publications. 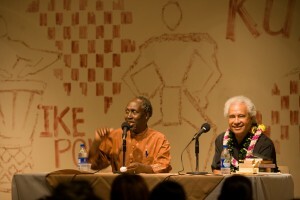 Thus, Wendt has not only been a key contributor to Pacific literature, but he has been a major force in its promotion both within and beyond the academy. Wendt’s writing is also characterized by intertextuality and self-reflexivity. Black Rainbow (1992), for example, borrows heavily from science fiction, mystery thrillers, works of “high” culture such as Kafka, Joyce and Camus, Polynesian mythology, and pop culture icons such as Blade Runner and Star Wars. The title itself is drawn from acclaimed Maori artist Ralph Hotere’s Black Rainbow lithograph series protesting nuclear testing in the Pacific (See Nuclear Proliferation in the Third World). As Ellis has suggested, Black Rainbow is “about other texts, constantly calling attention to its status as fiction and to the processes of representation” (“Postmodernism” 101). In Ola (1991), Wendt begins the novel with a foreword in which he explains that the novel is based on the contents of three beer cartons left on his front verandah by someone named Olamaiileoti Farou Monroe. The contents of the cartons included mementos from Ola’s life including diary entries, lists of things to do, poetry, etc. With these raw materials, Wendt claims merely to have rearranged “the pieces in such a way that the readers (including Ola) could see the connections, a unity” (7-8). With such a forward, Wendt is not only demonstrating his characteristic playfulness but also highlighting the degree to which fiction is the imaginative assembly and rendering of various bits of tales told before, life experiences of the author, and the reinterpretations of historical events into a whole. One might be tempted to suggest that Wendt’s work has simply come to adopt postmodern narrative techniques such as an emphasis on the constructed nature of the work and intertextuality. Wendt would however disagree with such a characterization, and argue that he is actually using and building upon traditional Polynesian narrative techniques. In an interview about these issues, he specifically points to his grandmother’s skill in telling fagogo, Samoan traditional stories, as a significant source of inspiration for him. In fagogo there is a set form, but significant freedom exists for the storyteller to add different, tangential stories, metanarrative comments, and even songs in the midst of the central narrative (Ellis “Techniques” 83-4). Indeed, Wendt has asserted that the styles of much of the writing being done by Pacific Islanders goes beyond realism to embrace pastiches of different elements. Ellis has asserted that Wendt’s fiction “can be read as an examination of how cultures are created, how various syncretic forms emerge and can be shaped in crucial ways to affirm rather than deny the vitality of new forms taken by traditional cultures” (“A Postmodernism” 104-5). In a very succinct way, this statement points to a particularly prominent theme in Wendt’s writings: culture, its production and what culture “means” to those who bear it. Wendt deals most explicitly with these issues in his essay “Towards a New Oceania” in which he rejects the position espoused by some indigenous elites in the Pacific (and elsewhere) that there should be a conscious return to a pre-contact past and a “traditional culture” untainted by Western influence. He disagrees not only with the characterization that cultures are static and can be somehow “preserved,” but also with the idea that the past was in any sense of the word “perfect.” He writes: “[t]here was no Fall, no sun-tanned Noble Savages existing in South Seas paradises, no Golden Age, except in Hollywood films . . . in the breathless sermons of our elite vampires, and in the fevered imaginations of our self-styled romantic revolutionaries” (644). (See Myths of the Native) He does, however, point out the importance of rooting oneself in one’s cultural traditions, as they are an important source of self-confidence, pride, and wisdom. He is highly critical of the colonial institutions of school and church that were based on the colonizer’s racist assumptions of superiority. These two institutions “undermined our confidence and self-respect, and made many of us ashamed of our cultures, transforming many of into Uncle Toms and revenants and what V.S. Naipaul has called ‘mimic men,’ inducing in us the feeling that only the foreign is right or proper or worthwhile” (648). However, Wendt does wholeheartedly support innovation, change and reinterpretation of those traditions to meet contemporary needs and issues. He rejects cultural homogeneity and the idea that a “true Samoan” must think/act/believe in a certain prescribed manner. Rather, he argues for a view where “usage determines authenticity” (644) and where the diversity of interpretations, views and beliefs of the different subcultures within a given society are the “life-blood” of that culture (646). Such a position cannot ignore the difficulty most groups and individuals will have in allowing such diversity to coexist in close proximity, but in Wendt’s opinion, allowing such diversity to blossom and grow is necessary for the growth and health of the larger culture and society. Wendt, Albert. Sons for the Return Home. Aukland: Longmore Paul, 1973. —. Pouliuli. Aukland: Longmore Paul, 1977. —. Leaves of the Banyan Tree. Garden City: Doubleday, 1979. —. Ola. New York: Penguin, 1991. —. Black Rainbow. Honolulu: University of Hawaii Press, 1992. —. The Mango’s Kiss., Ann Arbor: Vintage, 2003. —. The Adventures of Vela. Wellington: Huia Puplishers, 2009. Wendt, Albert. Flying Fox in a Freedom Tree. Aukland: Longmore Paul, 1974. —. The Birth and Death of the Miracle Man. New York: Viking Press, 1986. —. Small Packages. Aukland: Longmore Paul, 2000. —. Seven New Zealand Novellas. Aukland: Reed Publishing, 2003. Wendt, Albert. Inside Us the Dead: Poems 1961 to 1975. Aukland: Longman Paul, 1976. —. Shaman of Visions. Aukland: Aukland University Press, 1984. —. Photographs. Aukland: Aukland University Press, 1995. —. The Book of the Black Star. Aukland: Aukland University Press, 2002. Wendt, Albert (ed.) Some Modern Poetry from Fiji. Suva: Mana Publications, 1975. —. Some Modern Poetry from the New Hebrides. Suva: Mana Publications, 1975. —. Some Modern Poetry from the Solomons. Suva: Mana Publications, 1975. —. Some Modern Poetry from Vanuatu. Suva: Mana Publications, 1975. —. Some Modern Poetry from Western Samoa. Suva: Mana Publications, 1975. —. Lali, an Anthology of Pacific Literature. Aukland: Longman Paul, 1980. —. Nuanua: Pacific Writing in English since 1980. Honolulu: University of Hawaii Press, 1996. —. Whetu Moana: Contemporary Polynesian Poetry in English. Aukland: Aukland University Press, 2003. Durix, Jean-Pierre. The Attempt “To Snare the Void and Give it Word.” International Literature in English: Essays on the Major Writers. R. L. Ross,ed. New York: Garland Press, 1991. 63-73. Ellis, Juniper. “A Postmodernism of Resistance: Albert Wendt’s “Black Rainbow.” Ariel 25.4 (1994): 101-114. Ellis, Juniper. “‘The Techniques of Storytelling’: An Interview with Albert Wendt.” Ariel 28 .3 (1997): 79-94. Hereniko, V. & D. Hanlon. “An Interview with Albert Wendt.” The Contemporary Pacific 5.1 (1993): 112-131. Wendt, Albert. Towards a New Oceania. Arnold Anthology of Post Colonial Literature in English. 1982. J. Thieme, ed. New York: Arnold Press, 1996. 641-652. Wendt, Albert. Ola. Honolulu: University of Hawaii Press, 1991. Wendt, Albert. Leaves of the Banyan Tree. London: Penguin Press, 1978. Juniper Ellis. “‘The Techniques of Storytelling’: An Interview with Albert Wendt.” Ariel 28.3 (1997): 79-94. Vilsoni Hereniko & David Hanlon. “An Interview with Albert Wendt.” The Contemporary Pacific 5.1 (1993): 112-131. Michael Neill. Albert Wendt. In the Same Room: Conversations with New Zealand’s Writers. E. Alley and M. Williams, eds. Auckland: Auckland University Press, 1992. 100-118. Ed Rampell. “An Angry Man: Albert Wendt, Scholar, Author.” Pacific Islands Monthly. 60.1 (1990): 55-57. J.B. Beston. Interview with Albert Wendt. World Literature Written in English. 16.1 (1977): 151-162. Great! keep sharing awesome stuff.